Weather B cold. Couldn't work in garden, so retired to TPO and painted some chairs. F&W sold another boot scraper. "Peak" 45149 was live - apparently needed to get 150 psi (air brakes, at a guess) and currently managing 130. Nostalgia for me, as Peaks were introduced on St Pancras line which ran past my school. Chuffing up & down merrily (hopefully with enough coal, today!). Safety valves reported as "feathering" below 200 psi. I thought we had improved their seats and that cut-off had been much improved? Anyway, new springs are expected any day now. Hopefully, we can change them over next week, once 2807 is having a rest. Fred replaced the top & bottom disintegrating steps up to the TPO with new planking provided by Stuart. Gil painted some rail chairs, joined by Fred when the steps were completed. Then the two of them popped off to Winchcombe to play in the siphon. Stuart & I bumped into each other at Todders. John Clarke had given us a couple of old rail chairs, so we were only pottering about for a short while. I had a phone call circa 8.30 pm with a request for a red boot scraper! A fireman is retiring and his mates are buying him a boot scraper, and I guess they'd like it fire-engine-red! I slapped a red undercoat on an LMS rail chair! 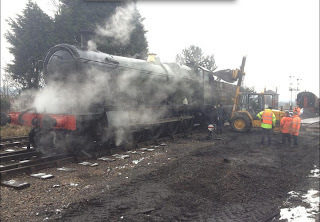 The Turkish 8F broke another spring this morning! Apparently, they had to replace it before going into service, so 2807 went out first to give them more time. As she was in service, there was only me at Toddington. Fred & Gilbert were at Winchcombe working on the siphon restoration. Stuart popped in to prepare for the stall on Monday. I painted several chairs and cleaned a further three, before deciding to go home. RHS valve spindle packing blowing excessively. So, you see how restoration and winter maintenance is far from the end of the workload! But apart from these, 2807 is running absolutely fine! I nipped down to Winchcombe station as 2807 was due in. Spoke with Ben (the driver) and he was happy with the steam heating; vacuum; and over the moon about the brakes (which clearly took him by surprise when he first applied them!). I checked the steam heat connection (where I'd noticed the apparent puff of steam where it was not expected, last week). There is no safety valve here (so that theory died). There was no steam leak at all ... so, I have no idea what the cause was ... but it's gone away! Surprised to see Foremarke Hall in service - it was a marketing day! I was giving a lighting-up training to a new recruit, Peter, so we did the practical on 2807. Peter spotted a couple of boiler tubes with ash in them! Val H sold 3 boot scrapers for us! I'm a bit vague about Wednesday. I think no one else turned up, so I did a spot of chair painting and then went home! The Boiler Inspector was very happy with the operation of the safety valves, after we'd improved the seating of them. New springs are still awaited for them, as the manufacturer discovered a flaw in one and is redoing it. Though the RHS eccentrics had been overhauled this winter, the LHS have not, because Rod (machine shop) became ill, and Race Trains were pressing us into service. The tubes had not been air-cleaned (we noticed on Monday!). Ingo has completed the CAD data for the new regulator valve, but the 1st prospective supplier couldn't handle CAD; the 2nd couldn't handle computers; the 3rd can make a sand casting; the 4th can 3-D print moulds or patterns. On the sales front, 00 scale wagons are no longer profitable (so we won't make any more); there's a new teddy in the offing, provisionally called Laverton Lil. 2807 is in service this weekend, and Tuesday & Wednesday. Nothing rostered beyond that, yet. It was only 2 degrees when I arrived at Todders, just before 9 am. 2807 was not over the pit, because 5542 had been clearing out its ashpan, so I couldn't get underneath to make a start at dismantling the steam heating pipe. There was 10 psi on the "clock", so I opened the steam heating valve in the cab to see if that was enough to push through the pipes. Opening the valve at the front of the loco (visible in the attached photos) there were gurgling noises, and soon some yeuky water spurted out. It took about 15 minutes in total, but it cleared the water in the front pipe and steam finally trickled out. It struck me afterwards that it was a good thing to have done, otherwise there is a good chance that David & I would have got wet when undoing the front pipe (because it's the low point). My real thought was that it would warm up the pipe, because it was a tad cold out there! 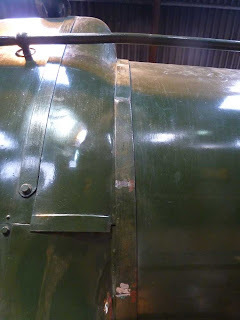 I also noticed that the steam trap beneath the tender was pushing out water (good!) and I opened the rear valve for a short while, and as soon as I closed it, a small trickle of water came out of the bottom of the valve, which demonstrates that Bruce's idea of drilling a drain inside the valve works! This idea came out of last year's problem of a small amount of water trapped within the valve when it closes froze, and modified the shape of the internals! Anyway, the 5542 chaps shunted us over the pit, and David & I began undoing the nuts & bolts and removing the front pipe section. David cut the pipe, then we offered it up and marked where we thought it should be welded together. Lots of trotting back & forth between loco and our work bench. The first attempt at tack-welding the pipe together somehow appeared to get the bolt hole roughly 45 degrees out of line! Back to the drawing board. 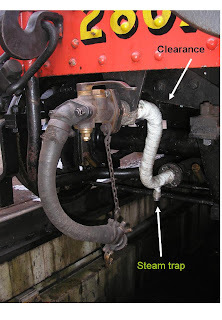 We figured it was more sensible to hold the pipe in place on the loco and tack-weld it in situ. G-clamp and rope did the trick. David found a huge (and heavy) 3-phase extension cable, such that power could reach our welder, and he did the job properly. I was little more than a gopher, most of the time. On Saturday, the "A Exam" revealed several minor items. Three loose nuts on the running board. One missing nut on a bracket. Brakes not good enough. GWSR chaps came and started fixing these. One could not figure out how to hold the head of round-headed bolts (on the running board). I fetched our molegrips and fixed two of the three. The third would not grip - it's clearly not going anywhere! I also fitted a nut to the offending bracket (there was already one nut & bolt, so it was not in danger of going AWOL). 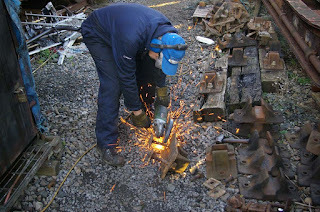 We left the GWSR chaps to grovel in the grease, adjusting the brakes! David finished the welding at about 2 pm. We put new insulation round the pipe and fitted it back in place. We stopped for lunch and then called it a day. Oh, and it snowed on us several times (not hard, though). I still don't know when 2807 will be in service. I deduce that we shall be in light steam this week as a standby in case 5542 or Foremarke fail. Oh, and the trial run to Laverton on Saturday at 4.30 was a success. Nothing ran hot. Nothing fell off! As reported previously, we got off to a flying start on this year’s winter maintenance by getting the axle box work done before Christmas. In January we re-started the work by replacing the safety valve springs with the spares and did a steam test. The valves were different to those we had taken off. They performed better not lifting until about 220 psig and maxing out at 226 psig. Good though this is, we hope to improve on it by switching to square section springs which are even stiffer. These new springs were expected before now but due to a manufacturing fault one of them had to be replaced and so 2807 has gone into the season with the ‘old’ springs. Other early work included a detailed examination of the retaining valve to establish why it seems to stick in service. Excessive clearances were found and the bore of the valve was found not to be true. So a new piston ring has been made, a new head machined, and the bore reamed true. Hopefully that has sorted the problem. 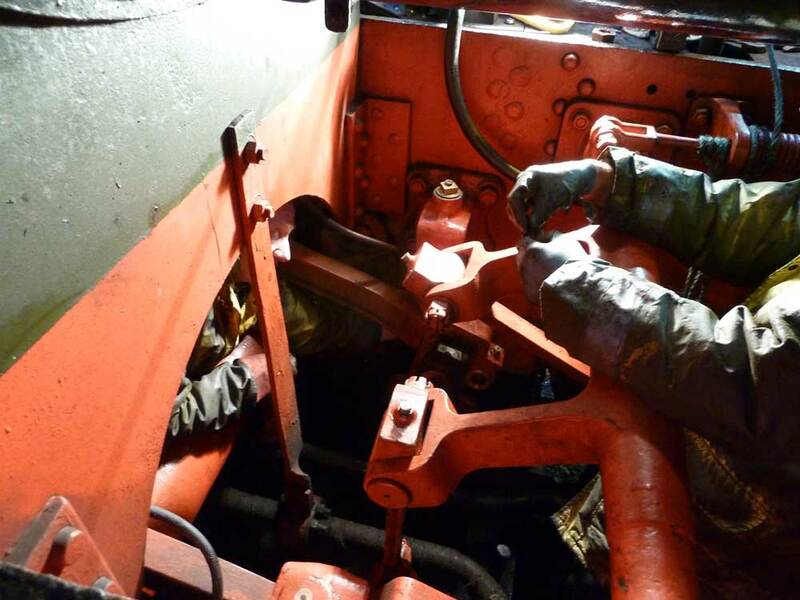 The valve gear was inspected. There was much less wear and tear noted on the spindles than last year. More than we would like but at least it meant that no rectification work was required this year. So we cleaned up the valve heads and put them back in the loco. 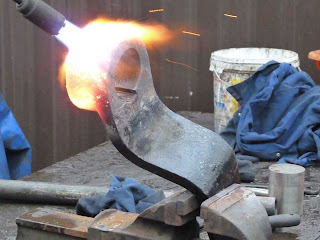 The next job was to inspect the connecting rod big ends for wear. When the con rods were removed and the bushes and bosses measured there was little sign of wear. This was good news and meant that we did not have to proceed with the repairs to the white metalling in the bushes. Whilst the con rods were off, we investigated the bottom pad on the LHS crosshead which had been using too much oil. The pad was found to be relatively loose. A new one was made to replace it. Then the motion was reassembled. The packing rings in the piston rod glands had been noted as having excessive wear. New ones had been made before the winter maintenance period. These were fitted. The Mason’s valve had failed on the last day of service. The problem was identified as a cracked sealing disc inside the valve. A new copper disc was made and fitted. The reversing lever had been reported as having too much play. The problem seemed to be with the arm on the wayshaft. The tapered pin had broken at one end and there was significant movement of the arm relative to the shaft. Simple fix? The trouble started when the tapered pin refused to cooperate. We had to buy a new drawing tool, use right angle drills, punches, heavy hammers, repair consequent damage to holes in the arm and the shaft before this “10 minute” job was finally finished! Another job that didn’t go to plan was the intent to renew tapered motion pins & expansion link bushes. Unfortunately we only managed to get the RHS done. The problem was limited machine shop time, partly due to the prolonged period of bad weather. A few other odds and sods were completed. For example, one of the unfinished cladding sheet jobs when the loco left Llangollen was to correct the number 5 cladding band. This had been put on as a straight band but really it needed to be a tapered band – correcting it is a simple, but time consuming, cutting and welding job and it wasn’t a high priority item. Well, finally and nearly 3 years later, we got round to doing it this winter. 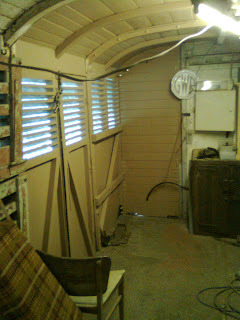 The tender spring we removed in November had been refurbished. 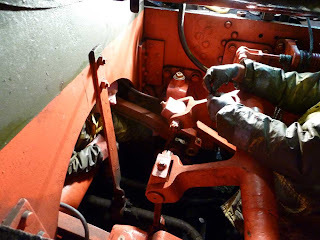 So the refurbished spring and our other spare were fitted to the trailing axle of the tender. That leaves the two middle axle springs to be refurbished and replaced at some future date but this is a low priority task now that the four corner springs have been done. Many thanks go out to those who have helped with winter maintenance including those people from the loco department who gave lots of valuable time and effort. Turning now to our siphon vehicle, the wood required to replace the cladding was delivered and is now being fitted to phase one in place of the rather ‘weathered’ existing boards. 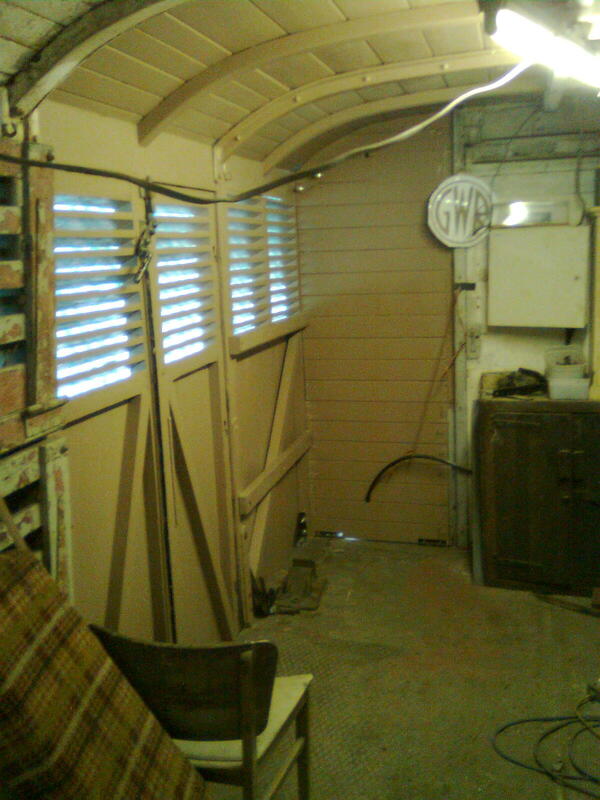 Phase one is just one corner of the vehicle, and work will now start of phase 2, replacing all rotten wood in the frames before that too is clad. We are still planning the replacement of the roofing, and are looking for a way to do this in ‘bite sized’ pieces rather than a ‘big bang’.